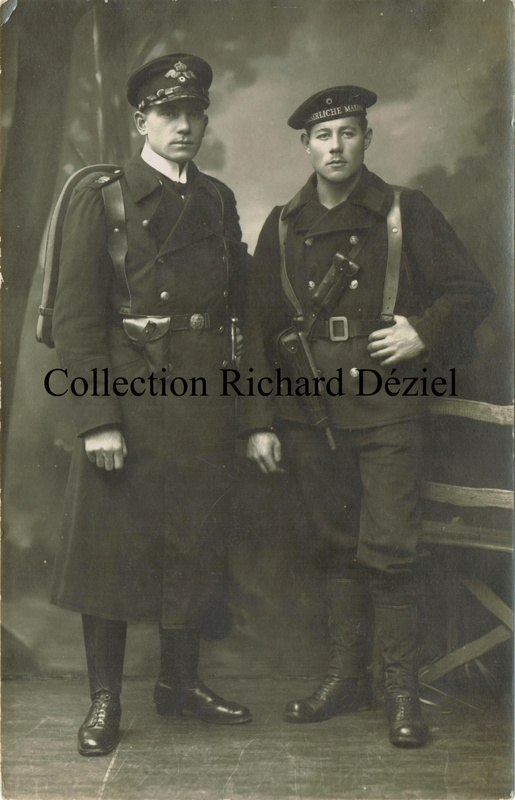 I'm asking for your help to have some information regarding the ranks and fonction of these two members of the Kaiserliche Marine. Last edited by Richard D; 10-27-2018 at 10:26 AM. Given the backpack, gaiters and weapons, I would guess that these two are part of a naval landing contingent. The man on the left is a Deckoffizier (I can't make out the insignia on his shoulder) and the man on the right appears to be a simple sailor of the Matrosen Division. Thank's for your opinion concerning this photo. 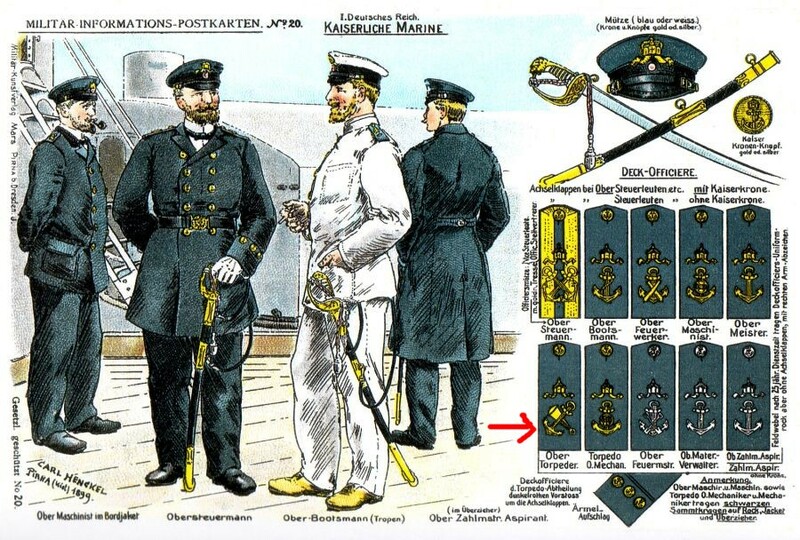 If we look at the following images, is it possible to think that the man on the left (surely a Deckoffizier as you said) is a Ober-Torpeder from a Torpedoabteilungen and that the man on the right an Obermatrose of a Torpedoabteilungen? do you think the belt which the "Ober-Torpeder Deckoffizier" is wearing, is made from brown leather, black leather or navy/dark- blue cloth ? The reason I ask, I have brown leather belt exactly like the one he is wearing with the smaller sized naval officer buckle and I have always wondered which branch of the Imperial German navy wore that type. 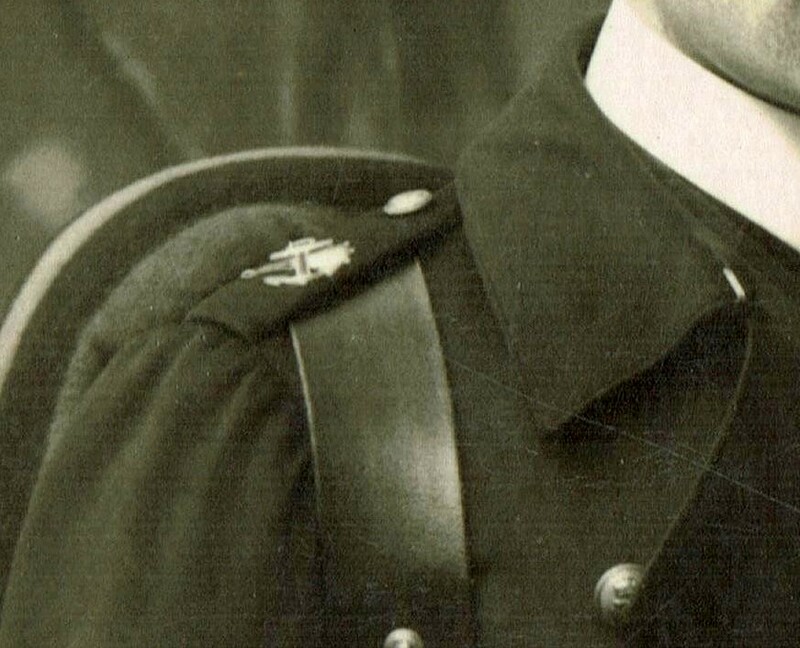 Your photo might have solved the mystery provided a Deckoffizier in naval landing uniform can wear brown leather instead of black, or was brown only worn with the naval field grey uniform ? Regrettably, I can't answer your question with certitude; only via my observation of the photo. 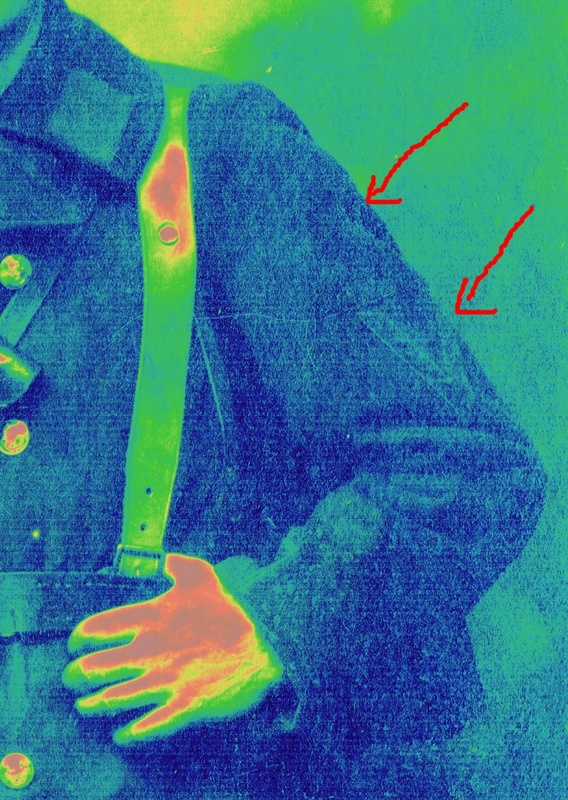 If we consider the stiffness of the officer's belt (it easily supports the holster) and compare its shade with the one of the sailor's straps belt, I would say that the belt of our officer is black leather. Thanks for the additional photos. 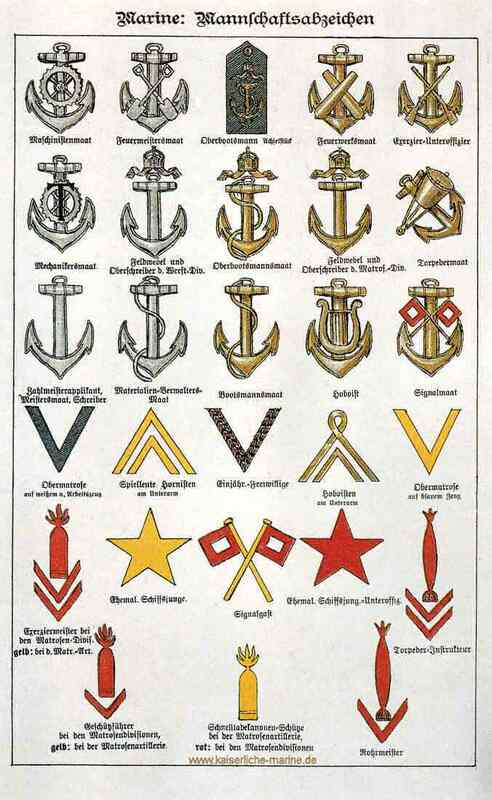 Yes, of course, the insignia is for the "Torpederaspirant" (no crown and riband) . It's a bit odd that the insignia seems to be backwards as opposed to those in the charts you have shown. So, this man (on left) is not an officer. 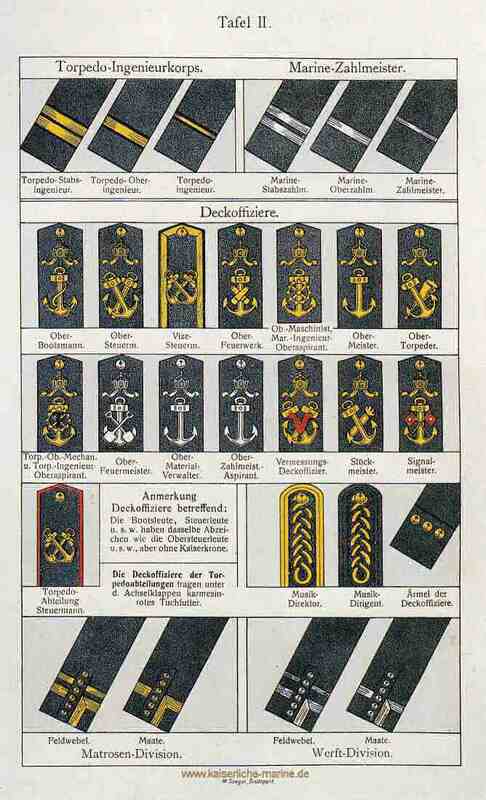 Can you tell me what is the equivalent in English of the rank of a Torpeder-Aspirant? I don't know if there is an English equivalent rank to "Torpederaspirant". It literally means "torpedo (deck officer) candidate".